When my friend Joe Campo said to me a year ago, he was initiating a legal processs of adoption – for a twin toddlers – my first reaction was “are you serious”! For sometime all we talked about was about our retirement – enjoy life as we get closer to our individual departure area. Joe Campo, a pillar of our association and always a generous supporter of the DAUSA Medical Mission is a U.S. citizen residing in Texas for over 30 years, happily married to Stella, a beautiful American-Mexican. The couple has two married children and grandchildren. Soon, my good friend Joe will be a dual citizen – officially a senior citizen – as he turns 60 in a few m onths. He is now entitled to some perks seniors enjoy, like a 10% discount at restaurants. But Joe is no ordinary 60 years old, as one having high blood pressure, high cholesterol, diabetes, arthritis or suffering from backaches, etc. My friend does not have any of those. Except for the hair that was gone many years ago, he’s fit, as if he’s only half his age, even bikes long distance. He recently participated in a 80-mile cycling fundraiser – from Freeport to Houston. A mutual friend of ours voiced his belief the twins could be Joe’s own from another woman in Danao, perhaps from a young girl working at Mitsumi. I said “that’s impossible. Joe would never do anything stupid to hurt his wife and children. I knew him well”. 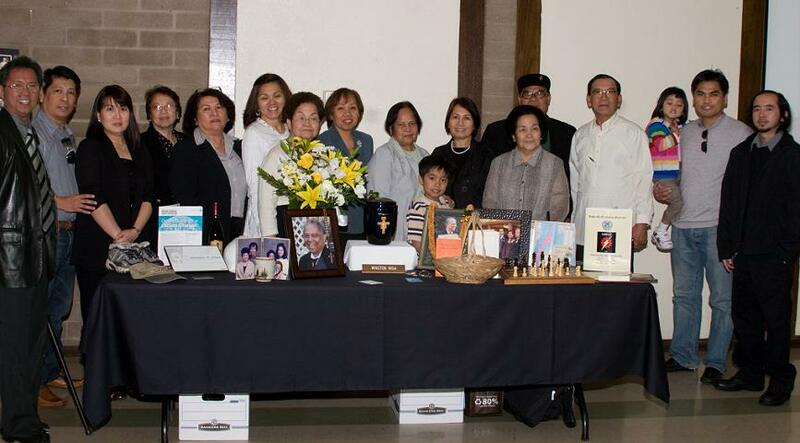 Joe used to be an altar boy; we both studied at the San Agustin Seminary in Manila. At first, he did want to become a priest, like his idol, Fr. Alfeo Manalili, but for some reasons he left after two years. He was looking for some adventures while still young and single; so became a seaman, a way he could travel and see the world. Then he ended up in Texas where he met and married his wife, Stella. Joe narrated how the adoption thing happened and he laughed when I told him some of our friends believed he was the biological dad. 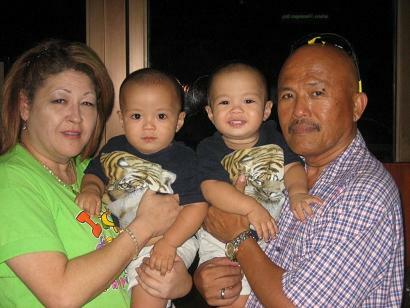 “The twin boys were born Sept. 7, 2008, two days old when we arrived Danao on Sept. 9th, for the DAUSA Medical Mission. “The biological parents were jobless, having 3 daughters: 18, 16 and 12 years old. The twins were delivered by caesarian at the Vicente Sotto Medical Center. Although it is a government hospital, and said to be a free for indigent patients, yet medicines, surgical supplies, blood transfusion, etc. are not free. “So, that’s where we came in, tried to help out and paid all the bills, so that mother and her twin boys could be saved and be home safe. The mother was 42 years old when she delivered two healthy boys. She is also blood related on my father’s side (first degree cousin). “We thought our rescue effort was over when mother and the twins got discharged from the hospital and came home. Unfortunately, that was not the case. At 42 years old, the mother’s breast milk could not sustain two hungry infants with good appetite. “So, the Good Samaritan that I was, got into action again by providing them with powder milk to keep the infants nourished and as well as diapers. A month later the parents and grandparents asked us if we are interested in adopting the twins and without hesitation my wife agreed right away without even consulting me. “A year had passed, we never felt any regrets adopting those boys. Really who can say no to those angels. At their age – Joseph Anthony and Mathew Philipp have given us so much joy and made Stella and me feel like a young Mom and Dad again. I have no doubt Joe will see his twin boys graduate high school, send them to college, and be at their wedding. Then he’ll retire from raising more kids at 90.